DAHLONEGA, Ga. – A 28-year-old Lula man has been charged with two counts of cruelty to children, two counts of making terrorist threats, simple battery and trespassing following a domestic incident at 2064 Coopers Gap Road last Friday. Daniel Preston Brock is charged with punching his girlfriend in the face, pushing her head into a sink and threatening to do harm to himself and others. He has been booked into the Lumpkin County Detention Center. According to the arrest report, Amanda Lynn Carter,26, was working as a housekeeper and cleaning the home on Coopers Gap. Brock picked up Carter’s daughter for her and brought her to that residence. Carter stated they began to argue and he grabbed her by the shoulders and started shaking her then punched her in the mouth. A witness, Randy Buffington, attempted to intervene and was allegedly threatened by Brock. Buffington said Brock continued to scream at Carter, forced her head down toward the kitchen sink and began punching holes in the sheetrock with his other hand. Brock left the residence when he saw Buffington calling 9-1-1. 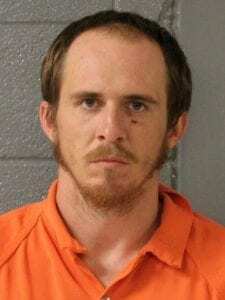 Lumpkin County Sheriff’s deputies arrested him two days later on a warrant.